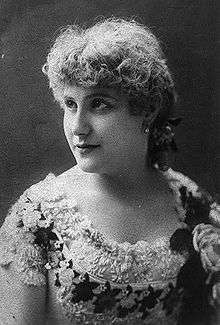 Emma Juch (July 4, 1861  – March 6, 1939) was a popular soprano opera singer of the 1880s and 1890s from Vienna, Austria. Her married name was Emma Antonia Joanna Juch Wellman. Her name was more properly Von Juch. Juch's father, Martin Juch, was a musician, artist, and inventor. Her mother's maiden name was Augusta Hahn. and she was French Hanoverian. Her parents were naturalized citizens who resided in Detroit, Michigan before returning to Austria for the settlement of the estate of Juch's grandfather, General Von Juch. Juch was also of Italian descent. Her parents returned to the United States when Juch was two years of age. She was raised in New York City. Her singing ability was inherited from her maternal grandmother. and her mother, who were both gifted singers. Martin Juch at first disapproved of a musical career for his daughter. Juch took lessons and practiced secretly. When she appeared in a concert she noticed her father in the front row. He heard his daughter sing and experienced a change of heart soon after. He encouraged her and gave her personal supervision. She was admired in the United States and England during a grand opera and concert career spanning thirteen years. Writing in his book, The American Singer, Oscar Thompson praised Juch by saying "her voice was one of unusually lovely quality and extraordinary purity." She could sing in four different languages, but her singing in English was especially praised for its clarity. Juch also sang proficiently in German, Italian, and French. Juch debuted as Philine in an Italian-language version of Mignon by Ambroise Thomas when she was 18. Colonel Henry Mapleson engaged her for a season that began at Her Majesty's Theatre in London, England. She made her United States debut in October 1881 at the Academy of Music in New York City. Eight months later, on June 10, 1882, she received favorable notice when she returned to that house as a participant in a memorial concert for operatic bass George Conly and virtuoso pianist Herman Rietzel, both recently drowned in a boating accident, a benefit that raised at least $4,000 for Conly's widow and children. Juch was the first singer contracted by the American Opera Company in 1886. When the company dissolved she formed the Emma Juch Company, which toured the United States and Mexico. In January 1890 Juch lived in a house on West Forty-Seventh Street in New York City. Before an engagement in Los Angeles, California, Juch acquired dresses for Carmen, Mignon, The Bohemian Girl, and Marguerite in Faust and Der Freischütz. Most of the clothing she designed herself, and she supervised its making as well. The dresses came from Paris, New York, and Philadelphia. About twenty of them were made at Wanamaker's in Philadelphia. The Emma Juch Opera Company opened in Faust at the Grand Opera House in Los Angeles on the night of January 6, 1890. Juch sang in four of the seven operas performed by the company, which had been on tour for ten weeks. The New York World complimented her on making great strides in singing the part of Marguerite since her tenure with the American Opera Company. A critic said "her impersonation of Marguerite is most delicate and charming," and particularly "the garden scene, most poetic." The Library of Congress holds one recording from 1904 (see External Links). 1 2 3 4 5 6 "Marquam Grand Opera House", Morning Oregonian, January 17, 1890, p. 7. 1 2 3 4 5 6 "Emma Juch, Noted American Singer", The New York Times, March 7, 1939, p. 27. 1 2 "Here and There", The Portsmouth Herald, March 10, 1939, p. 4. ↑ About Emma Juch, The Daily Northwestern, December 26, 1888, p. 1. ↑ "The Conly Benefit Concert," The New York Times, June 11, 1882. ↑ "Emma Juch's Gown's", Los Angeles Times, January 5, 1890, p. 2. ↑ "Music", Los Angeles Times, January 6, 1890, p. 5. ↑ "Former Opera Singer Succumbs in East", Los Angeles Times, March 7, 1939, p. 14. ↑ "Emma Juch Buried After Simple Rites", The New York Times, March 9, 1939, p. 21.